This post continues from The Mirren Post-Pitch Client Debriefing Guide – Part 1. Whether you’ve won or lost the pitch, getting practical feedback from the client is critical. With this type of call, however, the goal of the client is to get off the phone as quickly as possible. Your goal, on the other hand, is to uncover the truth. 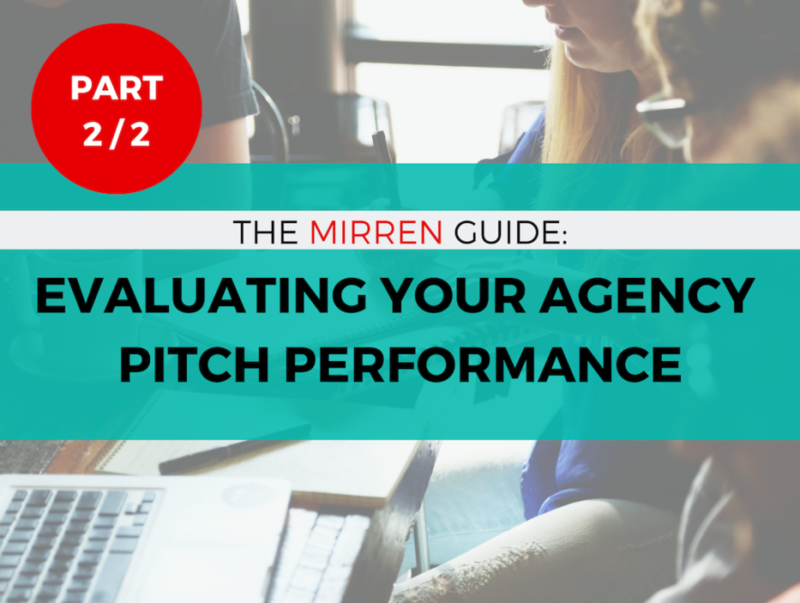 This Mirren guide provides a simple step-by-step approach to handle each feedback call. When handled methodically, you make it easier for the client to give you honest feedback, then helping you to effectively improve your new business approach. Where could this have been improved? Were our submissions clear and easy to understand? How did our fees compare to the winning agency? What did it for the agency who won? If the winning agency was a 10 out of 10, what would our agency be? How many agencies participated? At each stage? Did the selection criteria change in the end? Were there other criteria that came into play during the pitch process? Will you invite us again? Being authoritative and confident will ensure you get more out of the client. The opposite – sounding apologetic or meek – will confirm their choice not to select your agency and shorten the call. Part of the goal is to command the respect you deserve, but without being arrogant. Be specific in the questions you ask. Otherwise, you will most likely receive the “oh, so close but no cigar” answer. How effectively did our strategy address the brief? Lead the client through the process and do not let them off with vague answers. Rarely should you take the first answer at face value. Ask the client to expand on each answer. Get them to open up about why you were not selected. Remember this is a break-up call, so the client may initially be reluctant to open up. The onus is on you to lead the call. Once the call is complete, do not make any immediate and drastic changes to your process. You should not revise your approach based on one call, as the feedback is ultimately from only one person. Instead, look for common threads over time. If you hear the same feedback over several calls about specific areas of your process, then you should make the appropriate changes. When the post-pitch client debriefing call is orchestrated more methodically, it can play an invaluable role in helping to fine-tune your new business process – converting more business for the agency. Want to learn more about this, and other critical agency growth topics for agency chiefs, join us at The Mirren CEO Summit on November 6 – 7 in Chicago. In fact, our conference partner Winmo is providing a special discount for a limited time.